The Ups and Downs of IBS – Do I Look Sick? So, I think my journey to diagnosis has finally come to an end. Now, treatment, that’s another story. But I’ll deal with that when it comes. After my first GI doc was so discouraging, I had given up on seeking help and decided that, for all the money I was spending on tests, it was more economical to just be sick and deal. But after a while, my symptoms started worsening again, and I decided to give it a try just one more time. After the doctors at UNT guessed at IBS, I was feeling pretty optimistic. They referred me to Dr. Sanders. Yup. The rooms were full of ladybugs. As much as that sounds like a #WonderlandProblem (thanks witty coworkers for coining that phrase) I was oddly delighted. Ladybugs are lucky, right? Anyway, then I met Dr. Sanders. I don’t know that he’s Jewish, but he has that rich Jewish accent. And he’s really funny. He’s older, grey hair. Tall, skinny, but knobbly. Smiles lots. He kind of looks like Bill Nye the Science Guy, but with a very big red nose. I’m so not being racist, I just want you to be able to picture him properly, because he’s a great character and I’m quite fond of him. Dr. Sanders led off by asking about the other doctors I’d seen, and when I mentioned Dr. Rogoff’s name, he said he knew him. OH GREAT. Well, I like to think I’m a lady, and it would have been most unladylike for me to say what I really thought of Mr. Rogoff to a friend of his. But I did say that Dr. Rogoff called for a lot of very expensive tests, gave no answers, and above all, that I left because he never told me what we were looking for, or what our plan was. So, knowing that I would absolutely walk out his door and never ever come back unless we had good communication and he was nice to me, he made sure to tell me everything about everything and was quite nice to me. He suggested a blood test, and he wanted to see all the test results and post ops from not only Dr. Rogoff, but also all my endometriosis stuff. I was so pleased. Dr. Rogoff had never asked about seeing the endo stuff. I decided this guy was a good guy, and everything was going to be alright. When I asked what I should do over the Thanksgiving holiday, he breathed a heavy sigh. “Well, you only give me three days here.” I laughed. I liked him. He gave me little tiny pink easter eggs called amitiza. He said it could cause nausea, but only to a very small percentage of people. So guess what – I took it for three days, and I was sick as a dog. I never threw up, but I was so nauseated that I couldn’t do anything but lay very very still, and even then I was miserable. With Thanksgiving on the horizon, I made the executive decision to stop taking it over the holiday, and I felt much much better. So amitiza wasn’t the way to go. We talked, and he said doctors aren’t smart enough yet to know what causes IBS, but we do know that stress doesn’t help. He encouraged me to make time to do things I love. “Like running. But if you tell someone who doesn’t like running to run, well. But it’s not the running. It’s the doing something you like.” He paused. I didn’t know what to say. I felt like I really do spend most of my time doing things I like. So he went on. “And for some people, taking a pill helps.” He never once used the word antidepressant. But I knew that’s what he was talking about. I was like, this is my first appointment with this guy! Besides, I decided a long time ago that I don’t need antidepressants. Honestly, I didn’t believe in them. I didn’t believe that a pill could change my feelings, and even if it could, I didn’t want it to. So I said no need. Now…remember that I said he wanted to do a blood test? This is where things fall apart. We went to Quest Diagnostics. Usually, I like them. But the one in Carrollton… not so good. First, the lady was very attitudinal about my insurance. I got married, and my name changed, but not on my insurance since it’s still under my parent’s insurance. Most doctors I’ve seen just go “Oh, okay.” And file me as Rachel MarriedName – MaidenName. It’s not that crucial, as my little hip sister would say. But anyway, we got off on the wrong foot. So, once she was done giving me flack about that, she just turned around and stuck me. Out of the blue! I hadn’t even had a chance to mention that needles make me nervous. I sat still, and looked up into my husbands eyes. My eyes filled up to the very top with tears. Then we walked outside…to the car….got in….and made the hour long drive home. And I SOBBED THE ENTIRE TIME. I don’t think I’ve ever been lower. It was like…I had all this fear and sadness deep inside me, and all it needed was one little needle sized hole for it all to come pouring out. Hubby didn’t know what to do. He didn’t know why I was crying, and neither did I really. Was I overwhelmed by the prospect of another incurable disease? Was I just having a panic attack about the needle? I don’t know. But life was suddenly too much. I’d been hurting and sad and stressed about graduating and it had just been too much for too long, and I broke. I guess maybe antidepressants wouldn’t be the end of the world. It couldn’t hurt to try. Just to get me through graduation. Then, after everything calms down, I can stop them and just handle life again. He prescribed Zoloft. I was mad about this. It was antidepressants. I guess I was hoping that since he’d never called them that, maybe it would be something else. I did not want to be a bouncy round dot. I am better than that. I hate those stupid little guys. But it wasn’t the end of the world, and in fact, I do feel better. In fact, a lot of my IBS symptoms went away. When I went back to Dr. Sanders for a follow up, I was feeling as normal as I ever feel. No pain, no throwing up, just the endo stuff. IBS had sort of vanished. He did a couple more tests, and said firmly that it’s not crohns or colitis. I won’t need surgery, or anything like that. It’s IBS, and we can handle it. He said that the good news is that things are good now. IBS is cyclical, it comes and goes. Now, I’m in good times. There will be bad times later. And more good times of course. For now, he said, the zoloft seems to be helping, and prilosec is doing good. He said to stay the course for the holidays, and enjoy them. After that, we’ll see about weaning me off these medicines, and seeing if we can find a less intrusive, less take-a-pill-every-day way to deal with these things. 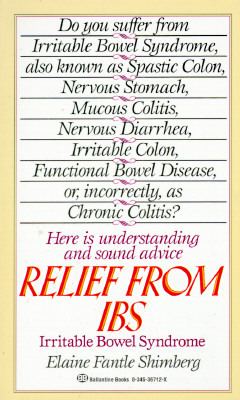 He also recommended a book: Relief From IBS by Elaine Fantle Shimberg. I’m still trying to find it, but if anyone wants to get it for me for Christmas it’s at the top of my list. He said it’s an old book, but still very good. He said the most important thing is to validate my illness – own that it’s a real thing. In these good times, it’s easy to think maybe it was all in your head. Catharsis and empathy are extremely important as we move forward. After that I got the flu, then I got a stomach flu. Then, literally the morning of my flight, I felt great just in time for my graduation/Christmas trip to Disneyland. I can’t wait to post about all that! I also still have a great interview waiting for you, and a blog award! So stay tuned. Life is all over the place, but right now is good times. I sincerely hope that good times find all of you this Christmas, too. Yes, ladybugs are good luck….hope that means this doctor will help you. I have been suffering terribly with HORRIBLE gas. My family wants me to go to a hotel….it’s really bad. Very painful cramping. I swear that whatever comes out of me in gaseous form should be purple or lime green. Sorry…..TMI. Hope you can get through the Holidays without too many problems. I hope your holidays turned out alright! So far the ladybug luck seems to still be working. Let’s hope we can find a good treatment! I will buy it for you! Just need a way to send it to you. Oh my goodness you are too too kind. My email address is diehardguardgirl@yahoo.com – send me your address too so I can send you a Christmas card! Sorry about that snippy needle lady! I absolutely hate and sometimes can’t handle people like that, I just get so tired of it. As for the break down in the car, I did the exact same thing last Christmas Eve, exact same place too – the car. I just could not pull it together, it was like every ounce of sadness and stress we “spoonies” (haha) have to deal with just comes flooding out. I really hope this doctor ends up being “the one” to help you through all of this. I’m so glad the Zoloft seems to be helping too!! I hope it doesn’t give you too many unpleasant side effects to deal with. Something about the car just makes you want to cry. It’s like a personal cry-pod you can run to if you cry in public. Yes, so far, zoloft seems to help. I had wanted to quit with the new year, but as I put together my portfolio and resume, I feel overwhelmed as ever, and there’s been more crying. Maybe I need to stick with it a bit longer than I thought. But I really don’t want to take it forever.